Every good coffee starts with fresh beans! The Dedica Grinder has 18 settings to give the flexibility to grind beans to the ideal size immediately before brewing, to achieve a fresh aromatic and flavourful coffee every time. At the heart of the Dedica Grinder is a durable stainless steel conical burr, ensuring the preservation of oils and aroma in your fresh coffee beans, all part of creating a perfect cup of coffee. For ease of use the design includes a LCD display to show the grind settings, number of cups and aroma preferences. All these features are encased in a strong but elegant design, a balanced mix of stainless steel angled and curved surfaces, and sits proudly next to the Dedica espresso machine. Engineered with an electronically controlled Thermoblock heating system and 15 bar pump, to ensure the perfect temperature and pressure for the espresso extraction. Designed for ease of use the adjustable Cappuccino System aides in the preparation of hot milk or creamy, silky milk froth to create everyone’s favourite café-style drinks. 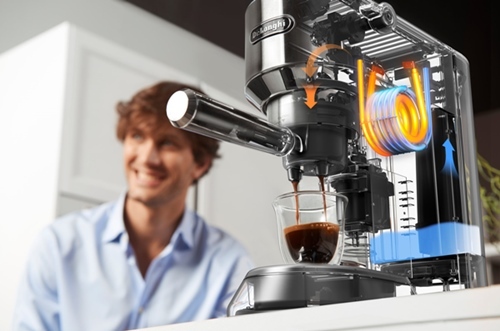 Smart and functional, the slimline design of the Dedica espresso machine is always ready for use with the self-priming system. Together, the De’Longhi Dedica grinder and espresso machine provides a complete barista experience to enjoy a great coffee at home.